Adam and Dianna Novy Lee travel the states of California and Oregon sourcing grapes for their appellation-designated and vineyard-designated Pinot Noirs. When I asked Adam why he takes on the challenge of so many cuvées in each vintage, he told me he likes Pinot Noir from practically everywhere and finds it a joy to make wines from diverse terroirs. Siduri is a real success story. The Lees arrived in California from Texas and began modestly in 1994 with an initial $24,000 investment and 107 cases of Anderson Valley Pinot Noir. They made that wine together and continue to do so for every wine they produce to this day. They quickly became renown as well as a model for other young Pinot Noir specialists such as Brian Loring (Loring Wine Company) and Andrew Vignello (A.P. Vin). Today, the Lees work out of a modest, utilitarian warehouse facility in Santa Rosa, but it is well equipped and adequately sized for their production (12,000 cases in 2011 and 23,000 cases in 2012). Each wine is vinified separately by block, clone and barrel type, with the end products being harmonious blends that best reflect the sites of origin. Both natural and inoculated ferments are employed. New French oak is kept to 25% or less. The wines are never fined or filtered. The Lees team up with about 27 growers stretching from Oregon’s Willamette Valley to California’s Sta. 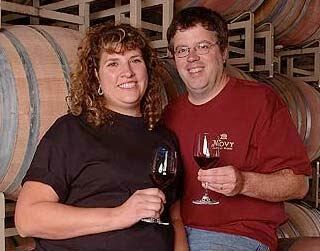 Rita Hills to establish viticulture regimens that suit them. They purchase all grapes by the acre to maximize quality, reducing yields as necessary to accomplish their goals, and always look to champion the origin of the wines. I spent a thoroughly enjoyable tasting session with Adam at his winery and in between the many hilarious stories he told me, we really did taste some wine. One tale that stood out was related to his close relationship with growers. He gave Gary Franscioni as an example. 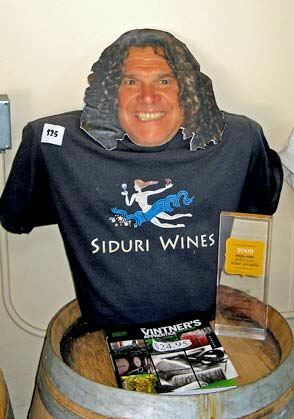 After Adam obtained an appropriate license, he married Gary at Gary’s request, and did an admirable job even though he was “half in the bag.” Adam has a very admirable positive spin on wine and you cannot help but see his gregarious personality in the Siduri wines. I previously summarized Adam’s thoughts on the 2011 vintage in this issue. Adam had to sell off wine in bulk for the first time in many years and declassified more than the usual number of lots into the appellation Pinot Noirs. The Keefer Ranch bottling, for example, is usually 1,000 cases, but was only 320 cases in this vintage. Only 30% of the Clos Pepe wine made the vineyard-designate bottling. Along with tasting all 16 Pinot Noirs produced at Siduri in 2011 with Adam, I re-tasted the wines at home in my usual fashion a few weeks later. The wines are generally less extracted in this vintage, with refreshing juiciness from bright acidity and easy approachability due to modest tannins. It is not a blockbuster vintage exemplified by husky wines, but rather a vintage of grace and concentration without weight. All wines are bottled under screwcap. Because of this, there is no worry about a corked wine, and I can report that I have never had a noticeable “off” wine from Siduri. The appellation wines were bottled August 2012 and the vineyard-designate wines January 2013. Siduri’s prices remain very reasonable. Drink the appellation wines over a casual dinner at home while your kids are fighting and complaining about homework and your wife is fretting over a stressful day. Drink the Garys’, Soberanes or Pisoni when your out to a special restaurant with your wife and you can spend some time with the wine. Why buy these wines? If you like variety, there is something for everyone in the Siduri lineup. Vineyard sources are superb, the vineyards are carefully farmed, and close grower relationships pay dividends. Anyone who can pull off vintage 2011 like Adam did, is a Houdini of wine. 13.1% alc., 613 cases, $29. Grapes were picked at low Brix (20º) in November (first time for Siduri) and luckily heavy rains held off. Severe crop thinning. Only 17% of fruit made the cut for this bottling, mostly from old vines. · A simple but easy drinking wine with shy cherry, sandalwood and espresso aromas, cherry and raspberry flavors, good acidity and very soft tannins. Respectable concentration in an elegant, light weight offering. Decent. 13.1% alc., 1,251 cases, $22. Primarily sourced from Van der Kamp Vineyard on Sonoma Mountain and Castro and Sexton Sonoma Coast vineyards. · Light reddish-purple color in the glass. Aromas of black cherries, new leather and subtle oak. Reasonably concentrated dark red cherry and berry flavors with a hint of cola, oak and savory spice. Light on its feet with an appealing delicacy. Decent. 12.9% alc., 1,252 cases, $32. 50% Sonatera Vineyard, 37% Castro Vineyard, 10% Ewald Vineyard and 3% Hirsch Vineyard. A blend of 8 clones from 11 different vineyard blocks picked both before and after the early October rains. · Moderately light reddish-purple color in the glass. Surprisingly concentrated and flavorful considering the very low alcohol (according to Adam, "This is one of the leanest Pinot Noirs at 12.9% alcohol we have ever made, and yet it is rich and concentrated"). Aromas of darker berries, plum and new oak but never really opens up over time in the glass. Moderately rich red fruit flavors are accented by savory herbs and oak. Soft in the mouth with good acidity that adds verve. Good. 14.3% alc., 2,434 cases, $32. A blend of fruit from five vineyards including 7 clones and 17 blocks, all of which were fermented and aged separately. · Moderately light garnet color in the glass. Quintessential Russian River Valley Pinot with deep, lush cherry cordial aromas and flavors, restrained tannins, good acidity, and a noteworthy cherry cola finish. Good. 14.5% alc., 1,333 cases, $32. 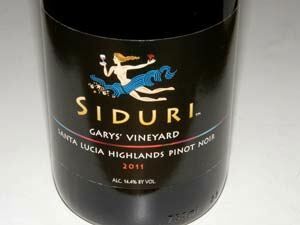 A blend of fruit from Santa Lucia Highlands vineyards that are sourced by Siduri. · Medium reddish-purple color in the glass. Very shy scent of darker berries and plum with a hint of oak. Never really opens up on the nose. Middleweight flavors of blackberry and black currant with a lacy oak overlay, softly textured with moderately muscular tannins. Decent. 14.1% alc., 1,014 cases, $32. A blend of fruit from Cargassachi, Clos Pepe and Sebastiano Vineyards. · Moderately light reddish-purple color in the glass. Appealing aromas of black raspberries, forest floor, and tobacco oak. Concentrated flavors of fresh black cherries, dark berries, spice, Hoison sauce and complimentary oak. A solid wine with redeeming balance that will have fans. Good (+). 13.2% alc., 307 cases, $32. 5 clones. · Light reddish-purple color in the glass. Nicely perfumed with intense Bing cherry aromas underlain with oak-driven espresso. Dark red cherry and berry fruits accented with baking spice are featured in a richly fruited wine with reasonable mid palate presence, styled with modest tannins and bright acidity, tailing off to a shallow finish with oak highlights. Decent. 14.9% alc., 149 cases, $48. A 3.1-acre vineyard in the Vine Hill area near Kistler. All fruit goes to Siduri. Clones 115 and 777. · Medium reddish-purple hue in the glass. Aromas of well-ripened cherries, cigar box and eucalyptus. Bright, juicy and crisp with a middleweight core of smoky black cherry and plum fruit, finishing with intensity. Has good concentration yet light on its feet. Still sporting a noticeable oak topcoat. Good. 14.2% alc., 320 cases, $52. · A classy wine with a velvety array of red cherry and strawberry fruit accented with baking spices and oak, which last through the generous aromatic finish. The acidity stands out in this wine. Adam likes to point out that the best 2011 wines have concentration without weight and this wine personifies that. My only nit is that there is a green thread running through this wine in the background. Good (+). 12.9% alc. $55. Siduri has purchased Hirsch fruit from the oldest section of the vineyard since 1995. 2011 was the last year for most of the old vineyard due to leaf roll virus. Very small crop, 20% whole cluster. Indigenous yeast fermentations. Only 3 out of 5 barrels made the cut and 2 of the barrels were aged in new French oak. · Light reddish color in the glass. Very reticent nose with extremely shy aromas of cherries and spice. Cherry fruit is featured with a confected gum drop and pastry overlay, but with some unusual, indescribable flavors. Very light with fine tannins peaking out on the finish. Decent. 235 cases, $48. Adjacent Garys’ Vineyard but rows are oriented differently so the winds pass through the vineyard more evenly and because it is more fertile, the vines are planted closer together. Fourth leaf. Pisoni selection, and 667. · Moderately dark reddish-purple color in the glass. Aromas of dark currants, ripe plum and brandied raisins. Delicious and harmonious, with gorgeous flavors of black plum and blackberries with a note of spice and citrus in the background. The fruit really sparkles in this wine and lasts and lasts on the finish that offers a teasing hint of spice and mocha. Spectacular the following day from a previously opened and closed bottle showing an Elvis on velvet mouth feel. A complete wine that is very refined and sophisticated and clearly the jewel of this vintage for Siduri. 14.4% alc., 419 cases, $52. Grapes picked prior to October rains. Pisoni selection on two rootstocks. Some whole cluster. Aged 14 months prior to bottling. · Moderate reddish-purple color in the glass. The nose explodes upon opening with fresh cherry aroma and hints of spice, herbs and redwood. On the palate, the layers of flashy cherry and raspberry fruit really draw your attention and hold it through a finish like a three hour movie you don’t want to end. Spend some quality time with this one as it will gradually become significantly better in the glass. 14.1% alc., 613 cases, $52. 38% 777, 27% Pommard, 27% 828 and 8% Pisoni clones. 115 did not make the final wine. Picked at 23.9º to 24.7º Brix. Mix of native and inoculated fermentations. · Medium dark reddish color in the glass. Nicely perfumed with bright aromas of cherry pie glaze, sandalwood and rose petals. Dark red strawberry and cherry flavors are featured in a mid weight style with balanced fine-grain tannins and some welcome finishing intensity. Offers some textural interest as well. Very good. 14.9% alc., 536 cases, $55. · Medium reddish-purple color in the glass. Typical aromas and flavors of Pisoni but more approachable and welcoming in this vintage. The nose offers scents of black currants, black grapes, and blackberries with hints of black licorice, dark chocolate and oak. Delicious, full-bodied core of black fruits including plum and grape with a hint of root beer, clothed in noticeable but relatively restrained tannins, finishing with power. The velvety mouth feel is very seductive. A wine of recognizable breeding, crafted with great skill. 14.4% alc., 445 cases, $52. Vineyard planted over several years (2007, 2008, 2010) by Gary Franscioni at the southern end of the Santa Lucia Highlands. Clone 23 (Mariafeld), Pommard and 943 (777 didn’t make the cut). · Deep, dark purple color in the glass. Aromas of spicy black raspberry with tobacco-laced oak in the background. The fruit really emerges with conviction as the wine is swirled in the glass over time. The mid palate infusion of nicely ripened dark red and black cherries and berries with a hint of Hoison sauce, anise, brown spice and oak is quite pleasurable. Soft and smooth on the palate with admirable balance and noticeable finishing presence. Very good. 14.2% alc., 196 cases, $54. · Only a third of the grapes harvested from this vineyard made it into this wine. Very modest reddish-purple color in the glass. The aromas never show up despite extended swirling in the glass. However, the flavors explode on the palate with intense flavors of black plum, black currant, and exotic brown spice. The fruit really makes an impression and finishes with power and length. Very soft in the mouth with supple tannins. Give this wine some time in the cellar. Very good.